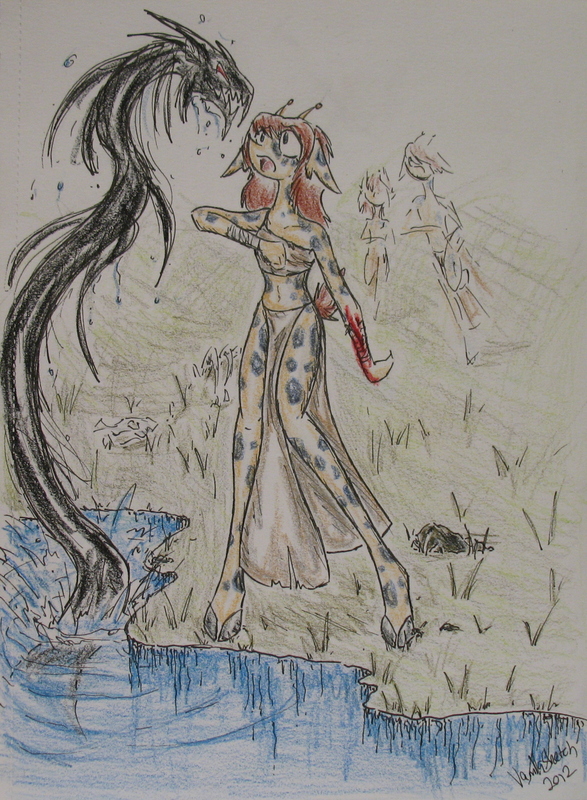 My still nameless giraffe character being attacked by a black ribbon snake. In this accident she lost her eye. Little character background: When this giraffe was young, she lived with her tribe in the Dead Lakes Valley between the mountains. The lakes of the Valley are very deep and in there lives many curious and dangerous creatures, like black ribbon snakes. The ground in the Valley is unfertile (and there are lots of skeletons lying in the grass for some reason) so the tribe had to collect their food from the plains over the mountains. One day group of explorers arrived to the valley. Giraffe decided to leave her tribe and go to the city with them. I had a dream about Dead Lakes Valley and Black ribbon snakes long time ago.